Hydro energy may very well prove to be a major player in meeting the energy needs of the global future, and there are many advantages of hydro energy that may not be found in other energy sources. 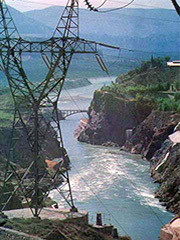 Hydro electric energy facilities can be placed in a number of locations, to provide domestic electricity and end the dependence on fossil fuels and foreign countries for our energy needs. There are a number of promising sources that will work to generate hydro electricity and energy, and one of the few requirements for this energy source is that water must be present. Wave power is one promising source of hydro energy that is available. The waves in the ocean are constantly moving, and wave power harnesses the energy used by waves as a renewable and alternative energy source. This technology is the newest of all those involving water, and it consists of air which is pushed by the waves. This displaced air then enters a turbine and causes it to turn. This generates hydro electric energy, which is then used to meet the power needs. Wave power systems may be anchored at the shoreline, where the waves hit the shore, or they can be set into deeper water by being attached to a flotation device. Tidal power is another form of hydro energy, and this source uses the power of the tides to turn underwater turbines. The tides only have an effect every six hours though, and the newer tidal power systems allow for constant and more efficient operation by placing the turbines in areas where denser water will flow more than four times a day. Harnessing the power of the tides in the ocean can provide a substantial amount of energy to be generated, without harming the atmosphere or depleting fossil fuels. Fast moving rivers can be very good locations to get the advantages of hydro energy. The fast flow of the water provides more energy to turn the turbines or the wheels. This is one of the oldest forms of hydro energy used, and it is the way that people in centuries past would grind wheat into flour. Rivers that flow swiftly in spots, like the Colorado River where the white water sections are found, can provide large amounts of needed energy and electricity. Because these rivers have fast moving water, they are one of the most efficient locations for a facility to generate hydro electricity. Waterfalls, such as Niagara Falls on the US Canadian border, show a lot of promise as a major source of hydro electric energy. Waterfalls contain water that flows quickly, and gains energy as the water falls over the edge. The force of the water falling can turn turbines and generate hydro electricity in amazing amounts. In these locations, the height of the waterfall is very important. The higher the water starts the fall the higher the energy the water will provide. Dams, like the Hoover Dam, have already shown the potential they can offer when it comes to hydro energy, and using it to create electricity. At one point in the past the Hoover Dam supplied enough electricity to light up Las Vegas, but this is no longer true thanks to a large number of lit signs on the strip. The dam holds back the water until it is needed, when it is released and allowed to flow over the turbines to generate electricity. There are overflow areas to prevent the water behind the dam from overfilling, and the energy generated can keep up with the demand normally. Posted on April 30th under Hydro Energy.